Livvyanarchy has supported a diverse range of artists including Kids in Glass Houses, the iconic Ten Pole Tudor, Keith Levene (ex-Clash and PiL) and Newport legend John Langford (The Mekons and the Three Johns). She also performed for a celebrity-laden audience at the Celtic Manor which included Micky Rourke. Hailing from the little village of Llandevaud. 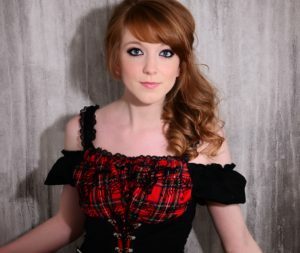 She has been gigging since the tender age of thirteen and has had the pleasure of performing at many of the great south Wales venues including the legendary TJ’s, The Globe and The Old Library along with many festival appearances both in the UK and abroad. This 21 year old Economics graduate completes her Masters degree this summer before embarking on a career in corporate finance. Many of her own compositions have political and social themes, are highly contemporary, are delivered with energy and frequently humour.